Karrimor SF QR Modular MOLLE open top twin ammunition pouch in Coyote Tan, Olive Green or black. Modular pouch suitable for use with most MOLLE type systems. Two magazine capacity suitable for most 30 round 5.56mm magazines. Including SA80A2, M16, M4, Diemaco and HK 416. This model will not accept AK type magazines, but will accommodate a pistol. Bungee cord closure for swift access. Bungee has pull tab for ease of use and can be length adjusted by knotting. 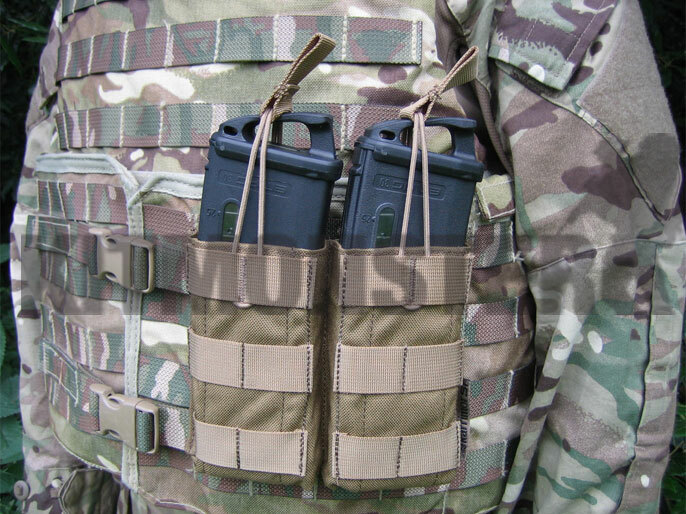 MOLLE strapped front allows double or triple stacking of these pouches, or the addition of other pouches. Colours listed as 'to order' are usually available within 7 - 10 days. This pouch is also available as a single, from stock, and in Crye Precision Multicam. Please see separate listings. Single pouch supplied. Osprey Armour cover, SA80A2 E Mags and MagPul Ranger Base Plates for illustration only, none of these are included.